Talk about being between a rock and a hard place – in the Old Testament passage where King David’s story is being told, we hear about David bringing Bathsheba into the palace, her giving birth to a son, and then David being confronted by the prophet Nathan concerning his sin against Uriah, Bathsheba’s husband. The other Old Testament passage is where “the whole congregation of the Israelites” were upset with Moses and Aaron. Now, beloved reader, who would you rather be confronted by? A prophet of God, or the disgruntled Israelites in the desert who had no food and very little drink. Me personally, I don’t think I would want to face down either one! Now, King David knew he was in the wrong; the prophet Nathan told an allegory about David taking Uriah’s wife. When David heard it he was inflamed . . .
Now you have to understand, beloved reader, the prophet Nathan had a tremendous tirade against King David, basically saying that David as a king and as a man will be disgraced somewhere down the road. I have been thinking about David a lot; and a great deal about David being a man after God’s own heart. Maybe the correct direction was David constantly seeking God, rather than God always approving of David. But, let us not leave Moses and Aaron hanging. You know, compared to the Israelites, David is looking pretty good. I mean, they would rather have died in captivity and slavery than to be free and able to live out their lives as they chose? I guess the Divine was practicing patience long before King David came along. These were the Lord God’s called and chosen people. From the time forward, from the Exodus to the coming of Jesus, the people of God were reminded of how much God had done for them. Yet each generation forgot, or neglected to pass on to the next generation the appreciation and adoration that was due to the Lord. Yes, I know that I have professed some reluctance to praise on demand. But I have not lodged complaints against Lord because I have found myself in dire situations. Nor have I taken advantage of my position in life to abscond with another’s possessions. Oh I have committed sin in my life – don’t think I am a saint. Each of us has our weak points – temptations that appear before us that we cannot and do not deny ourselves, or fleshpots and conveniences that we place more importance on than we should. And when our weak points become pitfalls we often need the reminder of what we have done and what we should do better. May you, beloved reader, overcome your weak points and remain strong against sin and temptation. Selah! I have had opportunities of going up small and large hills to look over the land below. 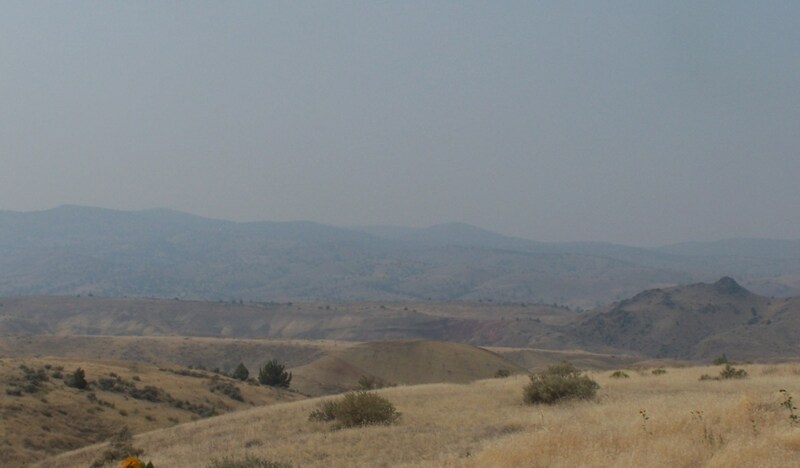 This is not a picture of a place close to where I live, but it does look a lot like the biblical lands of Moses might. Some places still do not show much signs of bustling civilization. Somewhere in Numbers (chapter 20:12 actually) it explains why Moses did not get to take God’s people into the new land. It was because Moses did not strictly adhere to God’s instructions. And it is one of the things in the Old Testament that puzzles me – that is, why the Lord God is portrayed one way in the Old Testament and another way in the New Testament. But it is not our task today to figure that out. I think in one respect it is a mercy that Moses did not cross over to the new land. Moses’ task under God was a specific one, and once accomplished he was given eternal rest. I’ll bet that was a tough 30 days. Moses had often gone up to hear from God, and this time he just did not come back. Moses was told back in chapter 32 that he would die up on the mountain. One has to assume he told the Israelites, if the writer of Deuteronomy knew what happened. The mantle of leadership passed, and the people prepared for their new life. Moses was remembered as a great prophet. He was a human prophet. And just as the Hebrews who were liberated from Egypt struggled to learn how to live as God’s people, Moses struggled to learn how to live as God’s prophet. The lessons that can be learned from a prophet are not just how to live perfectly, but how to evolve into a man of God. Where we read stories of the prophets, pay attention to where their struggles were and how they overcame them. Pay attention also to how God provides opportunities for growth for the Lord’s prophets. When things are tough and the tasks before you seem insurmountable, remember that your strength and ability is not the only thing that overcome the obstacles. God will provide. Selah! When we last left the Israelites, they had received from Moses the verbal Ten Commandments. The verses from last week’s RCL were not very clear that it was the verbal commandments as opposed to those written in stone. The mountain rumbled and the people were afraid. Moses tried to calm their fears, saying that the Lord God is placing fear within them so they would not sin. Then Moses went back up the mountain and received further instructions as to how the Lord’s called and chosen people should live – chapters 21 to 31. And while Moses was getting the refined and extensive commandments that covered all aspects of living, the Israelites were left alone. So all the people took off the gold rings from their ears, and brought them to Aaron. It would be easy, very easy, to easy to cast blame. Maybe the rumbling of the mountain scared the people and made the long for a more approachable god. Maybe Moses should not have put the “fear” of God in the Israelites. Maybe Aaron should not have given into temptation to be the “man with the golden plan.” Maybe a lot of things. It has been said many times by many people that the Old Testament is the story of a very imperfect people being formed and details all the mistakes and missteps of that story. Most likely a similar story could be told/written about our modern generations. In both cases it is important to remember that not all the people present at that time were all bad, or all good. When we hear stories of those who have gone astray, we mistakenly thought everyone went astray. And when we hear stories of people who have been completely faithful, we mistakenly think everyone was faithful. Humanity has been and will always be – a mixed bag. It is interesting, is it not beloved reader, that Moses pleads with God for mercy, and the Almighty, Eternal, Omni-Everything Lord is persuaded by a weak fallible human. There is something kinda weird here. I do not get much support from my favorite commentator, nor any other commentator for that matter. Barnes says this incident was a test to Moses as to which mattered to him more; the people he was leading or finding favor as the start of a new nation. And I struggle with this, beloved reader. I do. I have always felt a disconnect between the way God is portrayed in the Old Testament and the way the Lord God is portrayed in the New Testament. But the reason it bothers me so much is that at times people (ie believers) prevail upon the stern authoritative God for something and the gentle yielding God for others. Here God is swayed by Moses, yet we are to believe that God’s rage is a test for Moses? The Lord God threatens destruction for the Israelites that he saved just to prove a point to Moses? I can see where the commentators scramble to make sense of it. And I can understand why they search for a reason and rationale. I don’t have any definitive answer, but am left with questions. That is okay. Next week we will continue the story of the Israelite’s journey, and discern and ponder on what we find there. Selah! When we have been looking at the psalms passages, a common theme had been praising the Lord for what the Divine did for the Israelites when the Divine took them out of Egypt, saved from the Pharaoh’s army and provided for them in the desert. In return, the Divine had certain expectations and guidelines for them. We as modern Christians have taken them on as our guidelines. This, I think, was a consequence of the golden calf made by the Israelites when they desired something more tangible to focus worship on. It did not end well. In more modern times we have taken this as a warning not to make anything more important or more worthy of worship than the Lord God. Success at doing this, or not putting something in place of the Lord God, has had mixed success. Through the generations the Jews (or at least certain segments of Jews) have been very scrupulous about honoring the name of the Lord God. We modern believers have tried, in varying amounts of success, to keep the Lord God’s name holy. There has been some discussion as to when the Sabbath falls – the first day of the week, Sunday, honoring the day when Jesus arose. Or the seventh day of the week, Saturday, that is incorporated into our week as the day when God would have rested from creation. Additionally, there is discussion and mixed opinion as to how the Sabbath is kept holy. Again, differences of opinion have made murky what this commandment would mean. And yes, beloved reader, it is a trend you are seeing. While Moses brought the commandments straight down from the mountain, they have been commented on, paraphrased, and re-worked to keep up with the current understandings. So for this commandment, the discussion has been how to honor your parents? What does than mean in pragmatic terms? And what if one’s parents are not people who are honorable? Then there are commandments that would seem to be very clear. And even then they are tweaked and refined to incorporate practices from one generation, civilization and nation to another. Sometimes it seems that the very commandments that seem so clear and exact are the ones that are ignored by so many people. To digress just a little – I was at the public library the other day, and a fellow patron spotted a DVD of the Ten Commandments a la Cecil B DeMille. She made a comment to a friend that she had never seen the movie. I wanted to tell her it is something that I think everyone should see just once. Especially I think as I write this, the scene where the commandments are set down in stone, and then brought down the mountain. That scene I think restores a lot of honor to commandments that seen to have gotten wishy-washy over the years. Where has the impetus gone in obeying these very clearly set out guidelines and directions. Whole civilizations have been founded on the premise that these rules are important, and have been incorporated into laws. And governing bodies have been set up to make sure the laws are followed, and those acting counter to the laws have been punished. Many historians (amongst others) believe that societies start to crumble and be dismantled with these laws are ignored. And yet people disobey theses rules and laws right and left, and come up with all kinds of reasons, excuses, and logical rationale that it is okay to disobey these rules. The thing is, Jesus made these rules even more binding than when Moses delivered them. The Israelites who became the Jews as the centuries passed found ways to get around the spirit and intent of the law. As did Christians. History is more rife with people who flouted the rules and laws than those who obeyed them. Admittedly, I am getting quite pessimistic about humanity’s success, or lack of success, in keeping these laws. The judgment as to what is and is not sin is largely based on these laws. We can say it is when the Lord God is disobeyed, but the disobedience in large part is measured by these laws. Paul had a great deal to say about “laws” and their effectiveness in governing behalf. However, we are not in the New Testament but in the Old. The Israelites present at the bottom of the mountain where the laws were handed down had a pretty good view of the seriousness involved. Perhaps more so than any group of people since. They had a pretty good idea of what the basis was for establishing these rules. Perhaps their former life in Egypt had been in stark contrast to these rules. Maybe we also have known times and places where life has been lived out in stark contrast and defiance of these rules and laws. As I have read through this passage again, and thought about how the ten commandments are perceived by us in our modern times, it occurs to me that we have much less fear than the Israelites did at the bottom of the mountain. And maybe that is a significant difference. We are not afraid. More the fools us! For a while now I have been focusing on the Israelites as they journeyed from Egypt to the land that the Lord God had promised them. And I don’t just mean that the RCL has caused that focus. What I mean is that my focus has been on what the Israelites have been doing and saying. Of course they are weary and unsure of what the future will hold. They are not sure how to relate to this Yahweh, this Adonay, who is leading them. There ancestors of Abraham, Isaac, and Jacob are far removed from them. And Joseph enjoyed the comforts of Egypt (eventually) while they only knew the whip hand of their overlords and slave drivers. To hear them tell it, that was better than desert. But there is also Moses, who interprets what the “new” Lord God wants, and mediates the Divine’s message to them. What do they think of him? And how is Moses acting towards them? Some time back, Moses came down the mountain from communing with God, and Moses’ face glowed. It so unnerved the Israelites that Moses had to hide his face. I am not sure at this writing if Moses’ face was still covered. It seems a lot of times in this passages Moses has aligned himself with God; that is, he and God are guiding the people through the desert. And I have to wonder how the Israelites were separating out in their own minds the difference between the messenger of God and the Lord God the Divine. And as I ponder on these things, I have to think back to Moses encountering the burning bush. And how Moses was kind of reluctant at being drawn into this rescue mission of God’s. Moses had his encounter with the Divine then, and during the exodus in the desert. The Israelites had not seen the power of the Divine except through what Moses did. I do not mean to point fingers at anyone, really. But I can see things from the perspective of the Israelites. They are far from home, in “sketchy” conditions, and relying on an old man who gets testy with them. A few days ago I was commenting on one of the psalms that we a praise to God for delivering the Israelites from the Egyptians and shepherding them through the trials of the desert. Very good hindsight. But today, we are in the moment (or at least in the moment with the Israelites). And things have been pretty shaky. I can relate to that. It is a question that many have asked – is the Lord with us or not? Nations, armies, and generations have asked, does the Divine have our back or not? When things are hard going, and the odds are against us – is the Lord with us? Sure, we will be able to know in hindsight. But what about in the “now”? May you, beloved reader, find your own answer to that question. Shalom! “O give thanks to the LORD, call on his name, make known his deeds among the peoples. Not exactly a good match to the Old Testament passage for this week. As you remember the Israelites were complaining about being out in the desert, the lack of food and water, and remembering how much better the living conditions were in Egypt. But in the collective memory of the Israelites, when the psalms were being written, the Lord God was praised because NOW the Israelites were well established and living in comfort . . . according to those times. “Then he brought Israel out with silver and gold, and there was no one among their tribes who stumbled. Forgotten also were the days of uncertainty, and the fears they had beside the Red Sea. Gone also the fear of snakes and other tough lessons that the early Israelites had to learn. How is it (many times) that after tough times are past, and we collectively look back, we gloss over the hardships and suffering and remember only the good things? I suspect it is a survival instinct thing. And also, we were not the ones who actually went through the suffering but only hear the stories that came out of it. “For he remembered his holy promise, and Abraham, his servant. I also think that psalms like this assure, inspire, and remind us that others were in peril and had problems, and God was faithful to them. So the logical conclusion is that the Lord God will be faithful to us. But . . . if that is so, why did the later Israelites go so astray from the Lord God that had delivered and kept their forebearers safe while journeying through the desert? Why did not the collective memory of that hold the later Israelites in faithful worship to God? Furthermore, why does it not work in our current generation (that is, humanity collectively), this looking back to praise what God had done? It seems, just as I have said previously about the early Israelites, each generation for themselves has to learn the lessons of following the Lord God, and Jesus Christ. While we have scripture and the stories of our spiritual forebearers, the lessons there do not always translate to our current situation. And if I can be bold enough to say, I think it is writers like myself and others who serve to remind us of past lessons from the lives of others and encourage us to incorporate those lessons into our own lives. And if that is true, I am humbled that my writings might be used in that way. I often times write as much for my own edification as for others. May you, beloved reader, heed the lessons from generations ago. May the praise that is offered up to the Lord remind you of the blessings that come from living according to Jesus Christ’s example to us. Selah!